Darn humans! 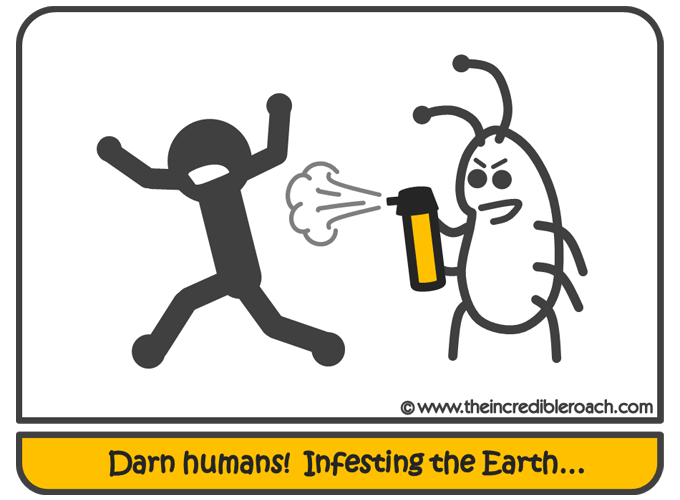 More than 7 Billion of them, and they have the gall to complain about "Roach infestations". Think they're so smart, but can't even predict their own doomsday correctly! End of the world my lower left foot! Must I do everything around here? This was a picture I made a while back, and was intended to be printed on a T-shirt. I've always dreamed of some day being able to fund the Roach's hosting through selling Roach-themed merchandise - would you buy something like this? Do leave a comment below and let me know!